Synopsis: “Mr. Church reunites the Expendables for what should be an easy paycheck, but when one of men is murdered on the job, their quest for revenge puts them deep in enemy territory and up against an unexpected threat” (Nusantara Edaran Filem). Verdict: Went into the cinema without expecting a good unpredictable plot or a non-corny script, and all that I was hoping for was a film packed with awesome action featuring the veteran stars I grew up watching. Unfortunately, it felt like there are even lesser action scenes here than its predecessor (2010). Offers good jokes but easy on action department with the small-fry villains standing around out in the open waiting to be shot by the good guys. Jet Li‘s hand-to-hand combat is greatly miss as he is only featured at the beginning of the movie. The last fight scene between Sylvester Stallone and Jean-Claude Van Damme is disappointingly quick as well. The Expendables 2 clearly failed to make a good balance use of the cast and is more of a parody of the veteran action stars. If you don’t really know the actors, you won’t catch the jokes. Second opinion: “Fun to watch and the action is interesting” (Iris Loong; didn’t see the first film). Yu Nan as Maggie: No idea why they chose her to play the role but she can’t act for nuts and she’s not even hot. She brought absolutely nothing to the table. Major plotholes: The team gets trapped in the plutonium mine with the workers but Trench (Arnold Schwarzenegger) appears at the right time to drill an exit for them. Mr. Church (Bruce Willis) appears soon after that. How in the world did they find out where exactly to find them? And then, they go firing at the villains’ trucks that are carrying tonnes of plutonium. More saggy muscles than brains, these heroes are. Most predictable: Billy’s (Liam Hemsworth) death. Caught it last night. I gave it 5/10 while hubster was generous with a 7/10. Liked it for its "no brain required to think" style. Just watch. Have a few laughs here and there. Finish and get home. 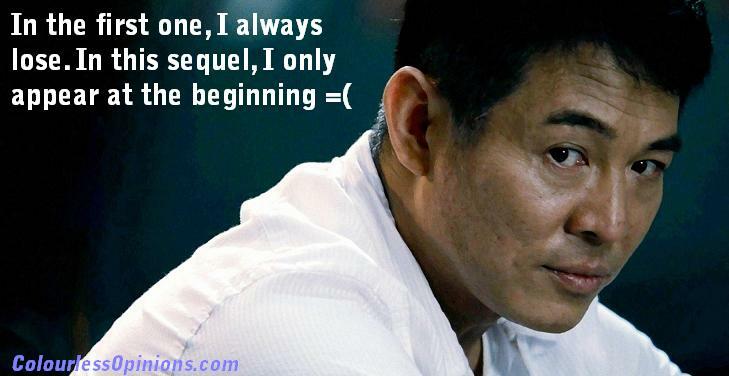 Jet Li…I watched till the end and went "Is that all for him"? haha also dont forget the part when sly, arnold and bruce opened fire, guns free in the airport when there are so many civilans running around. Watch just to see our ol action heroes in .. well.. Action. @Nana Yups you got that right. The beginning is the best action in a mission scene of the entire film. @Fluffy What's wrong with reading reviews after watching the movie? @Ernest I wondered about that part but even Iris doesn't know if they're civilians or bad guys as well. I was like, it can't be that dumb right?! Either way they're probably just paying tribute to the flaws in the old action films haha. no i meant reading reviews before i watch the movies. Read before then got all the spoilers liao. 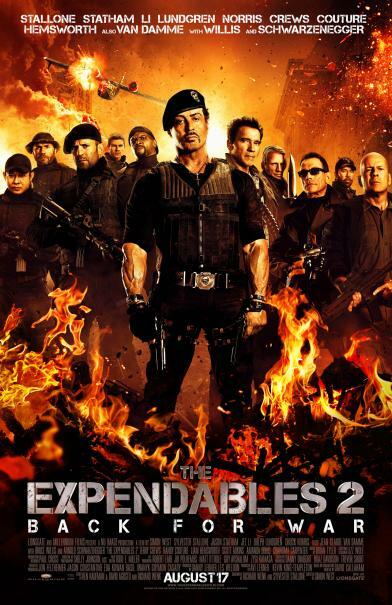 niaaa… I have high expectation on Expendables 2 sia. Jet Li only appears at the beginning? What a loser! Haha!! Less action than the first movie? Hmmm, don't think I will watch since there is already no story some more no action, then what else are there to watch? Lesser action even with more men in it? Gee, not really what I had in mind. Heck, I thought with Chuck Norris this should be one epic film. Um, you do know that shooting plutonium wouldn't do anything, right?